We're approaching the three year anniversary of Pokemon Go this summer, and we've almost got all of Gen 4 in the game now. There are nearly 500 Pokemon to catch in total and to catch 'em all, you're going to need our Pokemon Go tips. These Pokemon Go tips will help you catch everything from Pikachu to Piloswine, Machop to Magmortar, and Drowzee to Deoxys. We will help you complete your Pokedex and hit level 40 in no time at all, so before long you can dish out the Pokemon Go tips! 1. What's in your area? So you’ve just loaded up Pokemon Go and want to start filling that Pokedex. While the critters will instantly start spawning around you, you’ll want to look at the ‘Nearby’ menu in the bottom right of your screen to find out what’s where. Tap this and you’ll immediately get nine snapshots of Pokestops in your area and the Pokemon that’ll appear when you get there. Sure, sometimes it’ll just have a sea of Pidgeys but keep an eye here as your Pokedex starts filling up and you can use it to quickly identify where you need to go next. This is also where you’ll find all the Pokemon Raids taking place in your surrounding area but we’ll get onto more on them in a bit. It’s important to note that the ‘Nearby’ menu is currently the only way you’ll see what’s around, short of taking a walk. Third party Pokemon trackers are currently not working thanks to an API update in early 2018. The floaty blue bricks you can hopefully see spread out around the map are what's known as Pokestops. They tend to be local landmarks like churches and tourist spots and initially came from Niantic’s previous game Ingress. Since launch, these have evolved and you can even apply to get Pokestops authorised. No, asking for your house to be added doesn’t work… We’ve tried. When you get into range of a Pokestop, you'll get a bit of info on it, a nice picture and, most importantly, a little loot drop of new items. These will include a selection of much needed Poke Balls, revives, potions, and other special items. As you progress through levels, these rewards will vary more as you unlock better potions and revives. 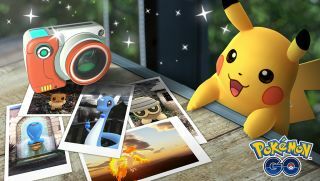 Research tasks will also drop from Pokestops and you’ll even get gifts to send to those on your friends list as a nice postcard reminder of your travels. Or, y’know, your walk to work. You don’t need to go right up to a Pokemon to catch it. If it has appeared on your map in cartoon form then you just need to touch it with your finger and you’ll enter the catching screen for Pokeball flicking. This means you don't need to go into a stranger's garden/car/personal space to retrieve a Pikachu. Phew. Check out the rest of our Pokemon Go myths busted. If you can see pink petals falling around a Pokestop, that means someone has attached a lure. You’ll earn them as you progress through levels and they’re available for purchase in the Shop. Lures mean Pokemon will be attracted to the area and it’s active for 30 minutes. The benefits can be used by all trainers so be a good human and activate at a stop you think the most people could make the most of it. You can even see the name of the trainer who donated the lure so you can try and thank them in person. Look out for community days where lures will last for three hours or even longer. The incense item is exceptionally useful if you want to bring in the most wild Pokemon right to your spot. Unlike the lure which can be shared, incense means you'll produce a purple cloud for half an hour that will draw Pokemon just to you. This is really helpful if you are perhaps in an area with Pokemon you don’t normally catch. Go to the seaside, pop an incense and you’ll immediately attract plenty of water Pokemon. You can even see the Pokemon that have arrived specifically because of the lure. They’ll have a purple circle around them. If you are using incense or a lure, it's good to buddy them up with a Lucky Egg that'll give you double XP for 30 minutes. If you've got all those Pokemon being drawn to you, you may as well make the most of the XP. Anything else that earns XP will automatically be doubled. Handy! One of the many rewards from Pokestops include eggs. These come in three standard varieties; 2km, 5km and 10km. While special eggs are sometimes available, these three are your regular drops. You have one infinite incubator in your item bag so always make sure you are using that as you go for walks. You’ll find your eggs by swiping right from your Pokemon collection screen. More incubators come in two different flavours. Standard and Super. Super Incubators will reduce the distance necessary to walk but are more expensive to buy in the shop. Regardless of which type they are, other incubators sadly can only be used three times before they break so make sure to put lower distance eggs in your infinite incubator and save higher distances for breakable ones. Good old maths. Keep up with your items. You have a limited number of item spaces and this fills up remarkably quickly if you’re hitting a lot of Pokestops. Want to use up some bits? Try dishing out those Razz Berries to hard to catch Pokemon or change your moves with Charged TMs or Fast TMs. If you get sick of spinning the icons on Pokestops and being told your bag is full, you can upgrade your item space by spending some very real money on Pokecoins. You can also delete items in your pack by hitting the trash can and then selecting how many of those items you'd like to drop to give yourself more room for Pokeballs. Keep in mind that you probably don’t need as many regular potions when you have super and hyper potions, or revives when you have plenty of max revives, and you’ll keep on top of your space without much extra investment. Where would Ash Ketchum be without his Pikachu? Bonds between trainer and Pokemon are not only cute, but beneficial. Head to your trainer profile and select the "Buddy" option from the menu. Here, you can select any Pokemon you've caught as your new walking partner. Walking with a buddy earns candy for its species, so it's particularly helpful to pick something rare in your area that you want to evolve. Dying for a Charizard but only caught one Charmander? Set him as your buddy and earn Charmander candy just for going on a stroll. Different species of Pokemon require different distances before you'll earn a candy for your trouble, so consult our chart of Pokemon Go buddy walking distances to help you make your pick. They’ve evolved over the years since launch but Pokemon Gyms are where you’ll test your Pokemon in battle against other trainer’s ‘mon. Now, while you’re not battling other players directly, it’s still an enjoyable face off. Gyms tend to be train stations or other big landmarks and you’ll see them proudly displaying Pokemon team colours. Yellow for Instinct, red for Valour and blue for Mystic. Each gym has a Pokestop at the top and up to six Pokemon inside. If you have arrived at a rival team’s gym, you can jump in and battle, or train if you are at a friendly gym. Gyms run on what’s called ‘Motivation.’ Every time you fight a Pokemon, its motivation drops. Drop the motivation of every Pokemon in the gym to 0 and you’ll win the gym. It might sound easy but it takes serious time to chip away at if you’re alone and the gym is full of powerful Pokemon. To save things being unfair though, you can’t have more than one of each type of Pokemon so you won’t find 6 Tyranitar to make your way through. If you pass a friendly gym and there’s a spare slot, you can leave your Pokemon to fight for your team. Bear in mind though that they’ll be there for the duration. You do get paid though. For every 10 minutes held you’ll earn one coin, up to a maximum of 50 coins a day. To fight a Pokemon at the gym, you don't have the same set up as the standard game. When you arrive in the arena you only have two move types - basic and special. In order to perform your basic attack all your need to do is tap away on your Pokemon. Fill up the special meter that you can see under your health bar and you can send out your special attack by holding your finger on your Pokemon. You'll also need to dodge incoming attacks too, which is just a matter of swiping left and right on the screen. If you want to fight at gyms you're going to have to level up your Pokemon, so that means increasing their CP stat. You can do this in the power up section when you are looking at your individual monsters - a combination of Stardust and Candy will do the trick. You can get Candy when you send back that specific Pokemon to Professor Willow so keep an eye out for that specific Pokemon and keep sending them back to earn more. It's big numbers of Candy that'll let you evolve too. When you evolve your Pokemon, you want them to be as high a CP as possible in order to evolve into an even more powerful beast. If you want to get into the nitty gritty of exactly how much you can level up, pop your Pokemon's details into an IV calculator such as Pokeassistant. This breaks down every category to give you information on your best possible ways to evolve. If you're one of those lapsed Pokemon Go players, you'll be pleased to hear that there's a lot more structure nowadays in how to play the game. Professor Oak has invaded Pokemon Go and is delivering a stack of challenges that give you a focus for playing. There are two types of challenges available in-game. The first are Field Research quests, which you pick up from Pokestops. They include tasks like winning a certain number of Gym Battles, taking part in a Raid or catching a certain number of a specific type of Pokemon. If you complete seven of these, you'll earn yourself a special Pokemon, which always comes equipped with a move that it can't usually learn. The second type are Special Quests. These are pre-set by the Poke Professor himself, and there are eight sets of three quests. If you complete them all - and they're not easy - you get the ultimate reward: your very own Mew. Another reason to come back to Pokemon Go regularly is the fact that there are now daily bonuses. Spinning a Pokestop and catching a Pokemon just once per day actually gets you some good rewards, and if you do it every day for a week, there are some even juicier treats to be had. It's taken like two years, but the wait is over. You can now have friends in Pokemon Go. In your trainer menu, there's a new friends tab that lets you add friends. You'll see your 12-digit friend code there, and to add anyone you'll need theirs or to share your own. Once you're friends though, you can send each other presents containing useful items like potions and Pokeballs on a daily basis. And what's more, you just pick up the presents at Pokestops and can exchange them for free. Other than that, you need to take into consideration that it costs Stardust to trade Pokemon, and a Pokemon's HP and CP will change when it's traded. You can view what the changes will be before you trade, but it's worth checking because you could get a high-level Pokemon seriously changing if you're trading with a player of a much lower level. You can't trade mythical Pokemon like Mew though, and anything of a shiny or Legendary variety will be much more expensive and can only be traded once per day. Gym battles are great, but if you see a Gym of your team with a open space for a Pokemon defender, it's worth dropping one of your highest level Pokemon in there to defend it for a while. Not only will you help boost that Gym's ranks, your Pokemon will actually earn you Pikachu coins for the duration of its time there, which you can then spend on lovely things like Incubators and bag upgrades. Sweet! Raids are another daily occurrence in Pokemon Go nowadays, and if you want to get some of the rarer Pokemon, and some of their evolutions, this is a great way to do it. They appear atop Gyms, and the game will tell you what's appeared and where. You'll need a Raid Pass (you can use and collect one per day), but after that it's just a case of wandering over to the relevant Gym as and when the Raid is live. It's worth noting though, that these are tricky. You'll want to gather some friends to battle with you, or make sure there are other trainers also joining you for the fight when you get there. The difficulty level is marked in masks under the Raid, and while it's possible to take down a level one or two solo, you're going to have to enlist some fellow trainers for anything tougher than that. Do you have any more tips for Pokemon Go? Let us know about them in the comments.